Deb's Cup of Tea: Makes my mouth happy. 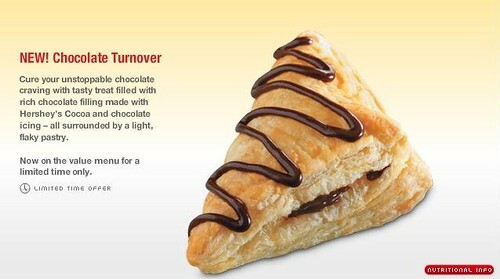 These turnovers are really good. You get them at Arby's and they have been gone for over a year. They were a limited time offering when they first appeared but I'd go to Arby's just to get one. I had to get garbage stickers today and Arby's is next to the hardware store. I didn't realize the turnovers were back until I walked in. (sigh) I really cannot afford to eat there even once a week but...but...chocolate turnovers. No, I don't care about the nutritional information, thank you very much. ...and they call the wind 'Maria'. Time to move the hoop. A bit of relief, perhaps. The things you see in the city. It sounds weird to say this. A perfect weekend for catching up. We don't like these, mom! May be the TMI post.